One of many photos from the site. This is a truly incredible resource for anyone interested in seeing pictures, video, and personal recollections of this storm. 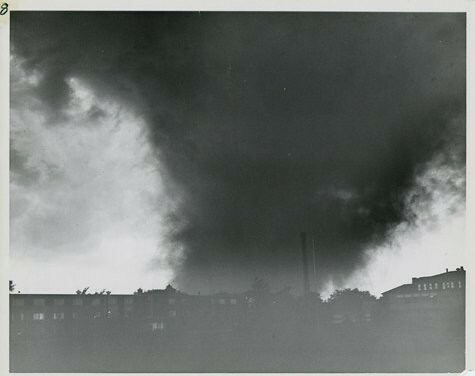 The Fargo Forum won a Pulitzer Prize in 1957 for their coverage of this tornado. My great uncle was chief photographer for the paper and he took many photographs of the aftermath. Photo from NDSU Institute for Regional Studies. Taken by Elwin E. Hutchinson. This one is rare and usually found cropped. The only place I have ever seen the full shot was in the 1957 World Book Annual that my grandparents had when I was a kid in the late 70s. 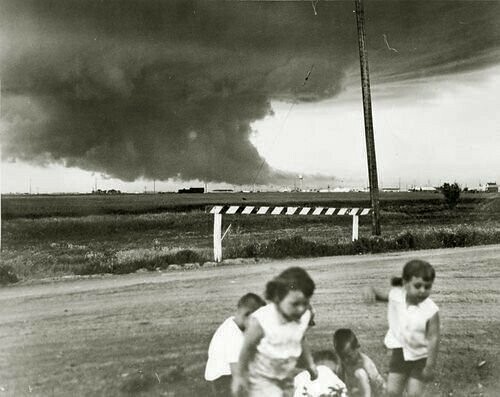 An eerie yet beautiful image, with the kids playing, totally disinterested in what's behind them. Taken by Alf Olsen. I came across his son's account, who is one of the kids in the forground. Turns out they are digging around in the old grave of a parakeet, which I found priceless. Courtesy of YouTube user Its A Random Channel!